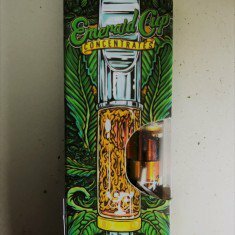 An Emerald Cup Concentrate is 100% pure cannabis oil in a disposable vape cartridge. These products are 50% Sativa and 50% Indica blends. We use no additives and synthetic ingredients. Our cannabis is naturally grown in Northern California’s premium cannabis region, and then cleanly extracted using a proprietary super critical CO2 method. Emerald Cup Oil Cartridges have between 61% – 73% potency. That is an incredible THC level at the best price. Emerald Cup Oil Cartridges are lab tested to verify cannabinoid and terpene profiles, and for mold, bacteria and pesticide residues. Candyland – Hybrid, Sativa-dominant – Taste: Earthy & Sweet – Candyland relieves pain, muscle tension, and sour moods. Its strong sativa traits give Candyland uplifting and stimulating effects, making it an ideal strain for social gatherings or creative moments. Durban Lime – Hybrid – Taste: Earthy & Sweet – if you want to stay proactive through a busy day, when exploring the outdoors, or when you need a spark of creativity, Durban Lime is the perfect hybrid strain for you. Emerald Cup OG – Hybrid, Indica-dominant – Taste: Earthy & Piney – Emerald Cup OG is a strong Indica strain, delivering heavy handed relaxation and sedation. Its potency is felt throughout the whole body. Emerald Cup OG is good for sleep disorders, migraines and stress. Pineapple Afghani – Hybrid – Taste: Sweet & Citrusy – The aroma of Pineapple Afghani sets it apart. It exudes a pineapple scent with hints of caramel and butter. It is often described as having a subtle sweet pineapple taste with a mint undertone. Berry White – Hybrid – Taste: Sour & Piney – Berry White is a cross between Blueberry and White Widow. The result is a balanced strain that offers relaxation, stress relief, and an impressive head high that helps you stay active and very much creative. Royal Kush – Hybrid – Taste: Earthy & Pungent – This popular hybrid delivers a strong, trance-like sensation. The effects range from euphoric and happy, then usually eases into a more relaxed and sedative feeling. This product is perfect for nighttime or if you want to unwind at the end of the day.